Non-Toxic Skincare Products That Work! I decided at age 22 to make some major changes to my life. I stopped drinking on the weekends, I switched from a largely vegan diet (full of tofu & millet, ugh) to a whole foods, grain-free and dairy-free lifestyle, and I started being more mindful of my mental state. I set myself free of the obligatory “hustle” that social media perpetuates in my generation and moved my bedtime up to 10 pm even on Fridays. I put myself and my health first, which meant saying “no”, disappointing people, and confusing my peers. And I got rid of toxic relationships like jealous friends, lingering exes, and quit my job in advertising after realizing I didn’t aspire to be like any of the people above me. I needed to do something more with my life, needed to affect more people in a positive way and do something that brought smiles and healing to others. I had always been a Sephora Girl. My Christmas presents had a 99% likelihood of coming from a little black and white bag. Glitter and pigmented products from Chanel, MAC & Nars were sprinkled all over my bathroom. I bought my face cleansers and body wash from the drugstore using whatever coupon was in my purse at the time. 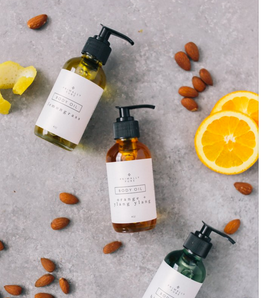 Never once wondering what was in these products although I did notice a group of them said paraben-free, sulfate-free, gluten-free, so I naturally switched over to those without really doing any research on why. When I found out I was pregnant in September 2015, I decided to finally switch EVERYTHING in my life over to the least toxic version I could source. It was one thing to knowingly mess with my hormones, skin integrity, and cancer risk, it was another to even consider doing that to my unborn daughter. I had a PRODUCT PURGING of sorts and it all went into the trash. I held onto some makeup like eyeshadows and mascara, but the stuff that had the most contact with my skin (foundation, moisturizers, etc) had to go. I started to do more research & pay more attention to what my Paleo peers were using in their bathrooms. One company kept coming to my attention: Primally Pure. The company had been hailed for their deodorant, face serums, and body butters. The packaging looked luxurious, feminine, and SIMPLE. There weren’t any ingredients I had to wrap my head around or wonder what the heck was doing in a product that I literally roll on my lymph nodes and near my breasts. I quit using deodorant 4 years ago but like any pregnant or lactating woman will tell you, hormones change how you smell. In fact, they can MAKE you smell, which is so not fair. I found that post-partum, I couldn’t get away with going bare under there anymore, even with my clean diet. Well, maybe I could, I live in Austin where a well-known swimming area is called Hippie Hollow. I just couldn’t stand this new wet feeling under my arms. Ick. So Bethany, the founder of Primally Pure and another new mommy (our babes are just a couple weeks apart!) sent me her Sensitive Deodorant to try. As a natural mama herself, I knew any products Bethany was making would be safe for me and Grace too. 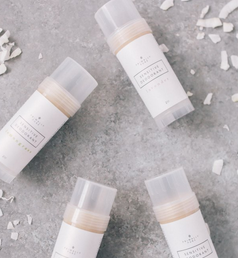 I was a little hesitant to try a deodorant made of arrowroot powder, tallow from grass-fed cows, baking soda, and organic coconut oil, and frankly doubted it would be as effective as store-bought deodorants. Also, would I smell like cow fat & a Paleo cookie? Thankfully, no, but now that I think of it that wouldn’t be so bad either. In fact, there’s 3 scents & 1 unscented you can choose from, and they get their lovely aromas from essential oils! I chose Lavender since it’s one of my favorite scents. And it is certainly lovely. It comes in a stick that you twist up, and lasts a looooooong time! I will be using this stick for at least a year! When you roll it on, it does leave a little white residue but that is very quickly ameliorated by rubbing it in for less than 5 seconds with your fingers. This deodorant doesn’t stain your clothes or leave marks on your clothes, and it’s not full of cancer-causing, hormone disrupting ingredients made as cheaply as possible in a manufacturing plant in Indonesia. I put it on at night after my one 2-minute shower every day and before my gym workouts. My workouts are tough – I’m drenched in sweat typically and always have somewhere to run afterwards. The only part of my body that manages to stay dry is my underarms, and I can comfortably run a few errands after air-drying the rest of me. Such is the life of an active girl, right? This deodorant ROCKS & I’m so glad I’ve found a safe option instead of going completely deodorant free! Since I live in the South, the majority of the year I usually don’t need to moisturize my skin… well, that used to be the case. I find my skin drier in these first post-partum months due to low hormones from breastfeeding. Coconut oil is typically what I put on my skin but I didn’t have enough time to rub it in well and it was getting all over Grace’s clothes. I switched to Primally Pure Lemongrass Body Oil. It comes in a beautiful recyclable glass bottle with a pump application. Just one quick pump and I have enough oil to cover my legs and arms in less than 30 seconds. It contains a mix of yummy carrier oils and essential oils, including the coveted tamanu oil which has healing benefits for the skin past simple moisturizing. The base is a mix of sweet almond oil, macadamia oil, argan oil, grapeseed oil, jojoba oil, extra virgin olive oil, and camelina oil. I put it on right after the shower and whatever is left on my hands, I run through the ends of my hair as an anti-frizz treatment! It can also be applied to the face, but I find my face too sensitive for this formula. Luckily, my face is loving the next Primally Pure product that has a permanent place in my bathroom! PS The Body Oils also come in Orange & Ylang Ylang and Blue Yarrow (great oil if you have a particular skin condition you are looking to address). Bethany is about as cool as California girls come and definitely a minimalist compared to the East Coast’s obsession with $400 face creams and weekly visits to their cosmetic derm. I’m allowed to say that – I’m actually an East Coast girl myself! Her Fancy Face Serum is definitely the fanciest product in her line of body care. It contains a mix of 17 therapeutic grade essential oils that not only moisturize but tone your skin & also can help with fine lines, wrinkles, acne scars, dry skin, discoloration, and general dull appearance. Now this product has a scent to it that definitely takes getting used to. Have you ever used straight-up neem oil? It used to be my face oil of choice but it’s just so stinky! Well, neem is one of the 17 oils in this serum but the other oils do a really awesome job of ALMOST covering up the scent of neem! Unlike the neem oil I used to use that would stink all night, I find the Fancy Face Serum scent to quickly diminish as it’s absorbed. I smell it while I’m putting it on and for maybe a couple minutes after, but that’s it! My husband hasn’t even asked me “what that smell is”, and I’ve been using it for 3 weeks now, which means there is no smell once it’s absorbed! I love Bethany’s descriptives of the purpose of each of the oils in this mix, so I’ll let you read them HERE. It’s really fascinating how potent and powerful essential oils and what a wide array of uses they have in our lives.I only use a couple drops of serum on my face after cleansing it each night, so I know the bottle will last me awhile. I’ve barely made a dent in it after 21 applications. My skin is more balanced, bright, even-toned since using this serum. I wake up in the morning just needing a quick splash of cold water on my face before I start the day. I’ve also noticed that I don’t need to exfoliate anymore, likely because this combination of oils both provides moisturize but also helps with cell turnover and rejuvenation. That means those dead skin cells don’t have time to just sit there and be dreary. They get eradicated with every application. This is a mom’s dream come true. Just ONE product that can do so much good. No need for a 4-step cleansing, exfoliating, toning, moisturizing routine anymore because frankly most of us just don’t have time for that! Who may benefit from cleaning up their skincare routine? All of us! In our modern toxic world, we all need to pay more attention to what products we are using on our skin and make informed choices for ourselves and our families.